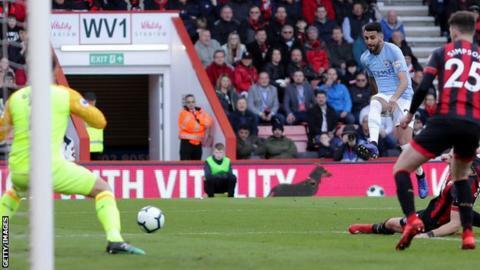 Manchester City moved two points clear at the top of the Premier League table with a 1-0 victory at Bournemouth, while Romelu Lukaku's dramatic late winner sent Manchester United up to fourth with an entertaining 3-2 victory over Southampton. Riyad Mahrez scored the only goal after 55 minutes for Pep Guardiola's City who claim a fifth straight league win. Liverpool have the chance to return to the top when they take on Everton in the Merseyside derby on Sunday (16:15 GMT). Andreas Pereira's stunning strike drew United level at Old Trafford, after 20-year-old defender Yan Valery's powerful long-range effort had given Southampton the lead. Romelu Lukaku fired United ahead and then scored an 88th-minute winner after James Ward-Prowse's exquisite free-kick had given Saints hope of winning a point. The victory sees United move above Arsenal, who were held 1-1 by north London rivals Tottenham in the day's early kick-off at Wembley. Harry Kane's second-half penalty for Spurs cancelled out Aaron Ramsey's early strike. But there was drama in the closing minutes as Pierre-Emerick Aubameyang saw his stoppage-time penalty saved by Tottenham goalkeeper Hugo Lloris, with the Gunners then finishing the match with 10 men after Lucas Torreira was sent off for a challenge on Danny Rose. Crystal Palace claimed a 3-1 victory over Burnley at Turf Moor to further ease their relegation fears. Michy Batshuayi and Wilfried Zaha made it comfortable for Roy Hodgson's side after Phil Bardsley's first half own-goal, though Ashley Barnes scored a late consolation for the hosts. Brighton's Florin Andone ended the Seagulls' run of seven league games without victory, heading in Anthony Knockaert's cross to secure a 1-0 win at home to bottom side Huddersfield and move Chris Hughton's side five points clear of the relegation places. Cardiff, meanwhile, remain two points adrift of safety after they were defeated by Wolves at Molineux. Two goals in two minutes from Diogo Jota and Raul Jimenez ensured the home side remain on course for a seventh-place finish. West Ham beat Newcastle 2-0 in Saturday's late kick-off, thanks to goals from Declan Rice and Mark Noble.